This review of “Green Lantern” contains a videoclip that could be considered as a spoiler. If you want to go into the film with as little knowledge as possible, please do not watch. Anyone that says or implies that “Green Lantern” is worst film of the summer–so far–isn’t being entirely honest. To be the best at something–even if your ‘best’ is your ‘worse’–takes effort. And while that film is probably not on too many people’s must-see lists, you have to admit that it’s remarkable that something so awful was ever made in the first place. I tried to watch “Heaven’s Gate” once and learned that it’s quite possibly the most self-indulgent, masturbatory bit of filmmaking that I have ever seen; but the thing is, you remember it. I don’t anticipate “Green Lantern” ever being that memorable because its greatest sin is that it’s simply, “Meh” and almost instantly forgettable. And while some critics also pointed out the dodgy CGI (computer generated images), and while that’s there too, it’s not as prevalent as some would make it seem. A note for any planned “Green Lantern” sequel: Don’t begin your movie with an entirely CGI opening scene. Many people will still not know who the character is (I suspect strongly that box office receipts will bare this out), so to begin things with four or five minutes of what looks like a glorified videogame doesn’t help matters. Another thing: Why have a character with a CGI mask, and have it look so odd and out of place that you probably would be better served by a practical one? Why invest what was probably thousands of dollars, and probably as many hours of computer cycles, to make a mask that not only could have better done in latex but also could have been done more cheaply. To add insult to injury it would probably have looked much better too. Then there’s the big, boss villain, who I will not reveal much about other than to say that he looks like a giant head with a body of poo (that’s not entirely fair, though that is the first impression you get). Ryan Reynolds is a decent actor, though what I have noticed about him is that its hard to separate him from the words writers put in his mouth (Though there are exceptions. As Hannibal King in “Blade: Trinity” the script that David Goyer wrote had such garbage issuing from Reynolds’ mouth that Satan–were he to exist–would have blushed) which means that he comes off as somewhat bland here. No one does badly, though no one is by any means exceptional either, with the exception of Peter Sarsgaard, who seems to think that he’s in another film; a much better one. “Green Lantern” is two movies: The first is a story of how Hal Jordan (Ryan Reynolds) discovers a ring of almost infinite power, and learns responsibility along the way. The second involves the Green Lantern Corps. It’s significantly more engaging, but takes up relatively little time compared to Hal Jordan’s story and is way too CGI heavy. Speaking of Hal Jordan, his voyage to becoming a hero goes way too smoothly. He starts off as a bit of a douche, though the part of the film where he earns redemption and takes responsibility for events in his life seems to have been left out. Though the greatest problem with “Green Lantern” is DC Comics is trying too hard to mimic the success of Marvel Studios, even down to the logos. Recent Marvel Studios’ films, from “Iron Man” to “Thor,” have had additional scenes at the end of the credits that lead to upcoming films. Guess what? “Green Lantern” also has an additional scene, though it doesn’t come when the credits are complete. Instead it comes midway, as if the producers knew that viewers would think so little of the film that proceeded them that they would have already left. 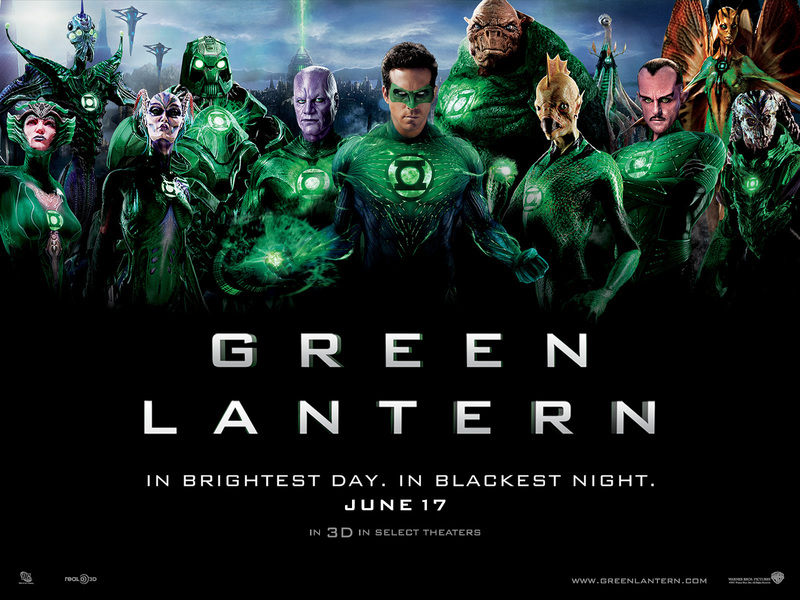 So, the problem with “Green Lantern” isn’t that it’s a bad film, it’s that it’s a remarkably inconsequential one. Posted in actors, DC Comics, Movies, review, superheroes, Warner Bros..Tagged Blade: Trinity, CGI, David Goyer, Green Lantern, Hannibal King, Heaven's Gate, Peter Sarsgaard, Plan 9 From Outer Space, Ryan Reynolds. Thanks for the comment! I’ll do that soon!